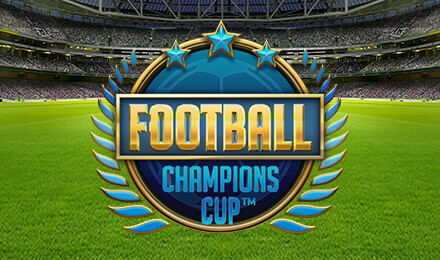 Put on your jersey and get ready to leave a winner when you play Football: Champions Cup Slots! There are FREE Spins, bonuses, Overlay Wilds & more! Spin to win Football: Champions Cup today and you may just take home the trophy! The stadium is packed with cheering fans, and there are loads of exciting features that will get your head in the game and have you winning big! There are Overlay Wilds as well as regular Wilds, plus a Free Spins Knockout Tournament, which will begin when you spin 3 or more Gold Trophy Scatter symbols. Do you have what it takes?